This is the last in our series of posts about the Trump regime. Part one can be found here, and part two is here. We have argued that Trump’s election represents a deepening impasse in neoliberalism, and that this impasse results from a systemic crisis in capitalism. As capital works to counteract falling profit rates by contracting social reproduction, it faces a growing problem of legitimacy. Delegitimation deepened slowly but steadily for years and fractured the consensus below the neoliberal order. Now the rise of Trump represents a sudden expansion of these fractures, which extend, like cracks in a windshield, deep into the state. 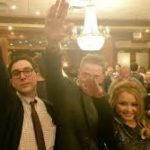 And the upsurge of right-wing nationalist populism that accompanies Trump’s presidency foreshadows even further ruptures, as it lays the conditions for a fascist politics that could sustain capitalist retrogression by devouring bourgeois democracy itself. In response to this deepening crisis, new forces have arisen that form an emerging, if still differentiated opposition. In the past decade immigrants, prisoners, public sector workers, students, teachers, middle class communities cast into the proletariat, the black proletariat and middle class, indigenous peoples, and a handful of private sector workers in healthcare, communications and transport have all launched moments of struggle, and in some cases larger ruptures. These forces carry within them the potential to destroy the current system. At the same time, they face internal limits borne of the conditions in which they arose. To grasp the limits and potentials of today’s struggles, we need to situate them in the shifting capitalist relations that produced them. At their foundations, proletarian struggles take shape within the capital-labor relationship. Capital must accumulate or die, constantly seeking to expand itself. Yet even as capital appears to grow on its own, it is actually a social relation–more precisely, a relation of labor to itself in alienated form–which depends upon living labor to exist. Without the continual alienation of living labor, capital would cease to reproduce itself. Nevertheless, workers are also a product of capital and depend on it in turn. To get the wages they need to live, proletarians are compelled to sell themselves to capitalists every day as labor power. Thus we are locked in a contradiction: capital and labor cling to one another even as they repel each other. This contradiction doesn’t stay still, but continually mutates as capitalist society develops and changes. The capital-labor relationship renders everything produced under capitalism into a contradictory mix of use value and exchange value. Our labor becomes a use value for capital, when we apply physical and mental skills to produce the surpluses that capitalists appropriate. But from our perspective, our labor is an exchange value, since we only sell our skills in order to receive the value of our labor power in the form of a wage. Our wages are paltry compared to the surpluses we create, but they are crucially important, because they are the only way to access use values under capitalism, where commodities are sold for profit and must be purchased with money. Thus the second aspect of our labor–its exchangeability in terms of capitalist value–comes to dominate the vast majority of the useful work we actually do in our lives. It also determines which use values we can access by buying commodities. If the value of labor power itself is driven downward (as expressed, for example, in falling real wages) then our access to commodities, and with it our ability to meet our needs, is similarly reduced. 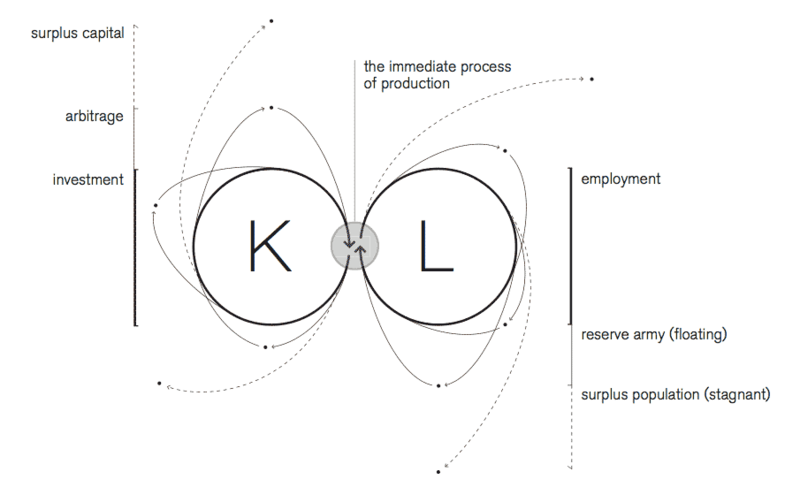 A visual representation of the unstable reproduction of the capital-labor relation, from “The Holding Pattern” in Endnotes #3. This arrangement grows increasingly contradictory as capitalism matures. On the one hand, the system produces fantastic accumulations of wealth, not simply in the form of physical goods, but also in the immense knowledge, technical capabilities, and ways of being available in modern society. On the other hand, the proletariat’s access to use values remains chained to the measly value of their labor power, thus preventing workers from fully appropriating the productive powers they themselves produce. It’s true that living conditions for the working class may improve in some periods, as capitalist development brings new use values with it. But over time, as a portion of overall social wealth, the proletarian share declines. This arrangement also leads to the falling profit rates mentioned in earlier posts. Over time, capitalists tend to automate production and raise productivity. This lowers the value of labor power employed in production, by cheapening the goods needed to reproduce workers and kicking some out of work altogether. Yet even as it helps individual firms survive, this process erodes the foundation of the capitalist system as a whole: living labor. With less living labor as the source of value, profit rates begin to slow. This tendency can drive an over-accumulation of capital––when fixed assets like machines and buildings pile up with no profitable way to use them––and eventually to economic depressions. Political and social conflicts erupt as different groups scramble to overcome obstacles to accumulation. Throughout the history of capitalism, such conflicts have destroyed massive amounts of capital and thereby renewed the basis for accumulation for a time. The 20th century saw this process unfold over two World Wars and the Great Depression, at a cost of over 100 million dead and the decimation of Europe and its former colonies. At the level of the state, capitalists managed devalorization through monetary policy and the central bank. First, they lowered interest rates to zero, making credit cheap in hopes of sustaining investment. Second, they increased the supply of money in a variety of ways, in order to lubricate transactions and complete the circuit of capital. The resulting expansion of credit and commerce did not renew investment in productive enterprises, however. Instead, facing dwindling profit rates in industrial production, capitalists tended to run machinery and infrastructure into the ground and shift their money elsewhere. Financial instruments proliferated that allowed capital to circulate ever more rapidly and extract income from already existing surpluses wherever they could be found, fueling speculative stock market bubbles, inflated asset prices, and corporate stock buybacks.2 The result has been the appearance of accumulation, even as real surpluses stagnate and claims on future surpluses multiply. In this way capital postponed a depression, but laid the groundwork for an even deeper, more globally interconnected crisis. The latest and most disastrous of these struck in 2008. Decades of devalorization have altered the capital-labor relationship, and produced a new kind of working class in turn. Struggling to sustain the M-C-M’ (accumulation) circuit as it flies across the globe, capitalists have appropriated a greater share of profits by disinvesting from the reproduction of labor power. They have decimated the conditions for wage growth by moving production to low-wage regions, introduced automation, and reduced pensions, health care, welfare payments, and expenditures on public infrastructure and education. All these measures shift the burden of social reproduction onto the individual worker’s wage, drive its average level downward, and destroy institutions of collective solidarity to create a precarious, atomized worker. Privatization of public goods has also created new income streams for individual firms. These provide firms the appearance of profits by looting assets for which they did not pay. And as state budgets shriveled along with their tax bases, private credit has filled the gap. This allows governments to pay for social reproduction in the short term, while creating new capitalist rents through high-interest debt and guaranteeing further austerity in the long term. Everywhere disinvestment from the reproduction of labor power is central to the devalorization of capital. Everywhere capitalists say we cannot pay and we will not pay. 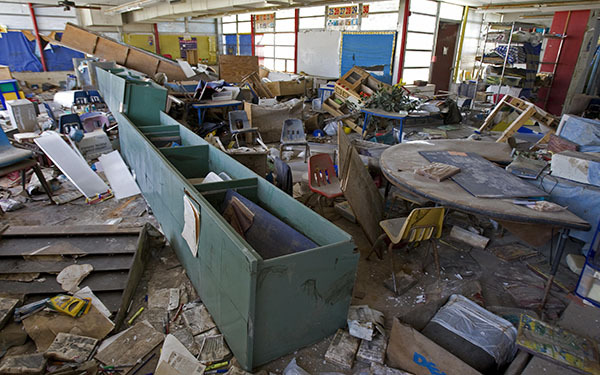 The capitalists used Hurricane Katrina to privatize the entire New Orleans public school system, creating income streams for charter schools while the state dis-invested from social reproduction. Photo from The 74. With these developments, the contradictions of the capital-labor relation grow increasingly acute. Capital is devouring labor power and the means of production to maintain chains of credit and debt, and keep the circuit of capital flowing. But with the value of labor power driven below its historic level, and workers increasingly expelled from production, capital not only faces the challenge of sustaining profit rates. It now also spurs forward a horrific contraction of social reproduction––literally killing the proletariat to sustain accumulation––and thereby erodes the basis for its own existence. Marx referred to the combination of growing productive forces and the undermining of the foundations of capitalism as a “moving contradiction.” Now this moving contradiction is approaching its own limit, and threatening the reproduction of the class relation itself.3 The conditions for maximizing free time and expanding human freedom exist all around us, but they are blocked, stunted or distorted by class relations. Today’s social movements are profoundly shaped by this tension. We are all compelled to grapple with our own non-reproduction in the shadow of immense productive forces. Our situation is therefore very different from the Keynesian era. Keynesian state capitalism completed the incorporation of workers organizations and reproduction strategies into the state and civil society. Unions were fully legalized, social democratic labor parties or similar organizations came to play a major role in political life, and the social reproduction of the working class was deducted from the national income in the form of pensions, benefits, and public education and welfare. These changes in the capital-labor relationship were driven forward at the point of production by industrial struggles and trade union representation. Welfare states in the capitalist core were paralleled by nationalist development regimes in the Third World, which similarly incorporated working classes and peasantries through redistribution and clientelism. 1968 marked the pivot between this period and our own, expressing the capitalist development that preceded it and foreshadowing what was to come. The 1960s rupture combined anti-colonial revolts in the Third World (against primitive accumulation and for development and modernization) with civil rights struggles, wildcat strikes and workers councils in the First and Second Worlds (against the assembly line and for rights, redistribution and control over the production process). But it also unleashed urban riots where deindustrialization was already beginning to show. Today the latter tendency has come to fruition. Across the globe, the current crisis encompasses the social reproduction of labor power as a whole. As capital drives down the value of labor power through wage cuts, disinvestment and debt, all sides of proletarian existence are rendered increasingly contradictory and conflict-prone–whether in healthcare, education, housing, or the police. The contradiction between use and exchange value comes to a head across all the areas of social reproduction, and the scale of class confrontation expands far beyond what it was forty years ago, even as struggles around production remain. Two sides of the same coin face each other in the looming shadow of social retrogression: the growing social wealth that expresses human needs, and the paltry labor power which produced but cannot appropriate it. These developments have led to an ongoing reorganization of bourgeois society. Less and less is civil society arranged to establish the social and political conditions for the development of labor power. Instead, it serves as an arena in which the driving down of living standards is bargained over and legitimated. Civil society becomes a vicious competition to retain relative advantages in a stagnating system, rather than a field of contested claims for recognition, citizenship and shares of the growing social wealth. Increasingly, pluralist liberal “democracy” is reduced to The Hunger Games. As the crisis deepens across all dimensions of proletarian life, movements erupt both expressing and refusing its effects. Many of these movements demand a return to the conditions and possibilities of a previous era through living wages, civil rights, or gender and sexual equality. Here resides the contradiction of today’s struggles: even as they seek to maintain the place of labor power within civil society, those very conditions are fading into history. Given the pressure on profits, capitalists are compelled to erode the condition of the working class. With capitalist retrogression ever more necessary, and reformism ever less possible, the problem of communism becomes immediate and concrete. Unless the proletariat abolishes the capital-labor relation and establishes a free society, we face annihilation. The choice between socialism and barbarism is becoming a matter of life and death. Though separated in time and space, these different fronts were all deeply interconnected, each an expression of a profound crisis in the social relations undergirding capitalist society. 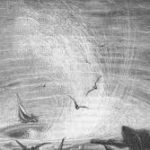 When struggles leapt across this web of relations, it indicated to participants how their situations affected one another, and allowed them to develop a shared collective consciousness. This was the formation of the working class, or what Marx called the “class-for-itself.” At first these movements were mediated as objects of capital, their relation to one another made clear only through their relationships to capitalist bosses and states. But as struggles circulated globally, they threatened to forge new connections with one another based on the material interactions through which they reproduced society and daily life. Here they revealed their potential to become subjects of history––to determine the course of change rather than simply enduring it––and overthrow capitalism. Today we are approaching a similar threshold. Since 2011, defensive struggles in the U.S. have multiplied, increased in tempo, and leapt qualitatively in scale and militancy. The Trump regime arrives in the wake of Occupy, Black Lives Matter, immigrant struggles, public and private sector actions and strikes, prison strikes, and Standing Rock. Alongside international events like the Arab Spring, these conflicts signal a new period of mass unrest, and their eruption in the span of a few years has driven some observers to confusion and despair. Yet this dizzying array of ruptures results from a globally interconnected capitalist system devouring itself to live, strangling social reproduction and propelling the proletariat into motion across many fronts at once. As in the period described by Cleaver, our own struggles may have the potential to develop global class consciousness and destroy capitalist relations. To understand the potentials of our moment, we must also feel out the limits of current struggles––limits that are fundamentally rooted in the objective conditions in which they have developed. As we have argued, the current period is defined by capital’s need to drive down the cost of labor power, recomposing the proletariat alongside the organizations that incorporated it into bourgeois society, such as unions and political parties. The proletariat’s position in civil society and the state is eroding, and this injects internal contradictions into every new struggle that emerges. Like in other struggles globally, the bulk of participants in U.S. movements from Wisconsin to Black Lives Matter are motivated by a desire for recognition as members of civil society. Outraged by inequality, austerity, and the criminalization used to maintain class relations, they demand bourgeois society grant equal rights to its citizens and redistribute surpluses in a more equitable manner. In this way, they take for granted capitalist social relations, and the specific forms of state and civil society that existed in an earlier era. As we have seen, claims for inclusion in civil society find ever less traction in a period of capitalist retrogression. Thus the very concerns that fuel today’s movements of “citizens” and “workers,” the very framing which provides them urgency and meaning, is simultaneously a limit which prevents them from challenging the fundamental conditions that birthed them. When a movement hits the limit of what it can achieve through these claims to rights and representation, it must either stagnate and lose momentum, or change its raison d’etre and become something new. As struggles continue to circulate and encounter this threshold, the pressure to transcend it mounts. 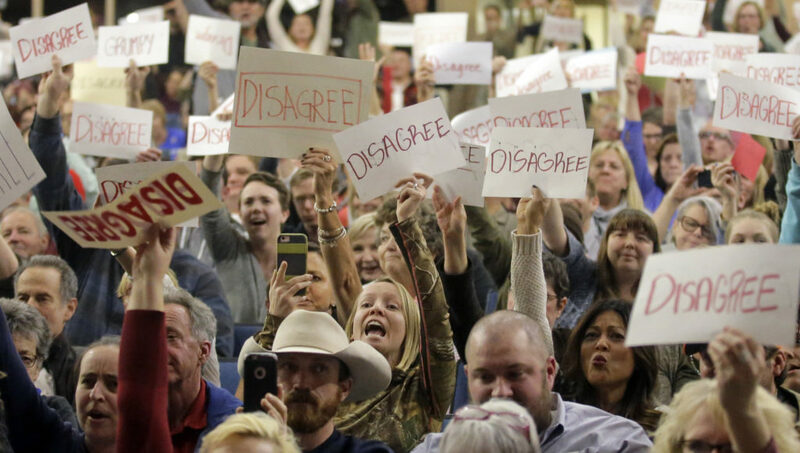 Protesters in Utah register their opposition to repealing Obamacare at a state representative’s town hall meeting, February 2017. Photo from NBC News. We can see this limit clearly in the case of working class whites. When other layers of the proletariat make claims on the state, they often do so in aspiration toward a future America that “never has been yet–– / And yet must be,” as Langston Hughes wrote. But for many whites, the same claims are explicitly nostalgic and resentful. They look backward to an imagined golden era in which “fair” wages, rights and living standards were defined consciously or unconsciously by white supremacy, and believe other struggles undermine their own. Thus the economic grievances and racial resentment of many working class whites cannot be separated: as long as these issues are framed and fought over in social democratic terms, they will be inclined toward racism. 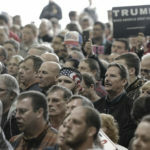 Not all whites who voted for Trump are ideologically committed racists, but trapped in a bid to restore their lost bargain with American capital, they will be invited to excuse the racism on which it historically rested, and on which its restoration could depend. Winning white workers to anti-racist politics thus requires an alternative that extends beyond bourgeois civil society. Other movements, notably Black Lives Matter, already strain against their limits at the moment they erupt. In confronting white supremacy, the black movement upsets a central lever used to erode civil society and contract social reproduction. At the same time, it challenges racism within the working class, and thus helps to “bring the proletariat on the scene” as C.L.R. James argued in 1948. But the call to “value black lives” can also remain trapped within the bounds of bourgeois civil society. In some cases BLM limited itself to transforming individual hearts, minds and values, without a meaningful strategy to reproduce black life. In other cases, strategy itself took the form of social-democratic programs still mired in the terms of civil society. The M4BL platform, for example, demands redistribution of capitalist profits through reparations and jobs programs, but leaves unaddressed the dwindling surpluses available under capitalism, and the racialized divisions required to sustain even this level of accumulation. As parts of the movement strain against the limits of civil society, they seek alternatives in abstract theoretical trends such as Afro-pessimism, or concrete refusals such as the Dallas and Baton Rouge cop shootings. The feminist movement remains less developed than the black movement in the current cycle of struggle, but it too holds the potential to rupture capitalist social relations. Feminist struggles challenge the gendered division between waged labor and unwaged reproduction that lies at the core of capitalism, and from which arise an array of gender and sexual norms, family structures, and labor market distinctions. Detonating this division challenges the patriarchal organization of social reproduction, and upsets a central hierarchy within the proletariat. Yet as we saw with the women’s marches that followed Trump’s inauguration, movements premised only on claims for equal wages and legal rights can leave unaddressed many other racial, gender and sexual stratifications integral to capital. The 2017 Global Women’s Strike protests represented a step toward a new revolutionary feminist politics, but we have yet to see how these politics might sustain themselves, and what limits they might encounter in turn. Within the official labor movement, workers struggles have remained muzzled by the bounds of civil society for decades, relegated to continual holding actions and defeats. Many contemporary trade unions make wage demands but refuse to bargain over workers’ control of the labor process, defend narrow self-interest while undercutting the proletariat as a whole, or refuse to break the law in strikes and job actions. These barriers keep workers entrenched in the norms of capitalist civil society, and deter them from challenging private property, the state, or the capitalist division of labor. 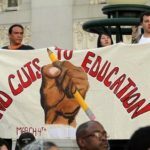 Yet aspects of the 2012 Chicago teacher’s strikes and the rank-and-file actions of Detroit teachers (both of which drew in students and parents), and the insubordination of the UAW auto workers during their 2015 contract negotiations, show that alternatives are possible. 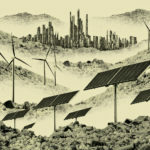 Developing these potentials could help movements circulate between the realm of reproduction and production, a threshold Theorie Communiste refers to as the “glass floor.” Only when this barrier is overcome will struggles be able to leap beyond the streets and challenge value production, the basis of capitalist social relations. How can committed revolutionaries contribute to the emergence of revolutionary class consciousness that aims beyond civil society and our existence as labor power? Speaking very generally, we believe we must help struggles to circulate through their internal relations. In philosophy, internal relations are relationships that constitute what an entity is, rather than external relationships that are contingent, and which do not alter an entity’s being as such.6 In the context of capitalist society, this might refer to the economic and political relationships that allow a given class position to exist. An “undocumented worker,” for example, is constituted in specific economic relations that require low-wage precarious labor, and specific legal and political relations that distinguish between citizen and non-citizen. When undocumented farmworkers erupt in struggle, their actions concretely impact other workers connected through this web of relations, and vice-versa. Their strikes ripple up and down the production chain to truckers or grocery store clerks, and across the immigration bureaucracy to legal clerks or case managers. When workers coordinate their actions across this web of relations, they experience each other as integrally connected within a potential whole, rather than separate entities demanding abstract rights from the state. They cease to be “the labor movement” or “the legal profession” supporting “the immigrants,” and become a class in formation, discovering its collective power by exercising it. By contrast, today’s movements are replete with external relationships between organizations and identities. Big protest marches often unite groups externally, compiling a vast list of grievances from different organizations, putting speakers on the mic to represent each issue, and exhorting the audience to “realize that all our struggles are connected.” Such appeals assume different movements are distinct from the outset, and then try to glue them together based on a moral principle of solidarity, or their shared opposition to a common enemy. Valuable coalitions may be formed in this way, but a revolutionary movement requires more. So long as the political subjectivities through which we mobilize remain external to one another, we remain distinct groups, demanding rights from bosses or the state as members of civil society. We may be politically aligned due to strategy or ethics, but we cannot “see” the relationships through which we reproduce one another, and which we could steer in other directions. This approach can secure important gains for distinct parts of the proletariat, but it also inclines these groups to vie with one another for shares of the total surplus. This is a disastrous dynamic in an era in which the surpluses needed to sustain redistribution, and to bankroll the state with its rights regime, rest upon the contracted social reproduction of the class as a whole. Escaping this arrangement requires organizations and political imaginaries that build on the material ways that different sectors of the proletariat are already interconnected, and which envision transforming these relations in the process of exercising collective power. Today’s movements will realize their transformative potential if they can transcend demands of citizenship, recognition, rights and redistribution––the claims of political subjects in civil society––which presuppose a dying period of capitalism. If and when movements aim beyond the capitalist relations in this manner, it will mark the emergence of a revolutionary mass movement in the U.S.
We see the seeds of this leap in the airport protests against Trump’s Muslim ban that erupted across the country in January 2017. In this case, a particular flashpoint sparked by Trump’s policies drew a variety of layers into motion. 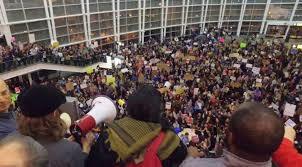 First, protesters swarmed airports where foreign nationals were detained, and immigration lawyers formed ad-hoc groups to defend detainees in their professional capacities. Then, taxi drivers in New York City declared a strike on rides to and from JFK airport in solidarity with the protests. Finally, when Uber directed its workers to scab on this de facto picket line, up to 200,000 people deleted the app in protest. In this small way, the airport protests leapt organically from the realm of civil society to value production and circulation, welding together different areas of working class life in a collective act of refusal.7 Detainees, protesters, lawyers, taxi drivers, and Uber users were brought together not through distinct organizations adhering to a shared set of paper demands, but as groupings formed around concrete activities that were interconnected by virtue of their place in the reproduction of capital, and which could therefore mutually reinforce one another against those relations. Crucially, it was with reference to this experience that the first mainstream calls for a general strike emerged (even though we can’t pull one off yet). 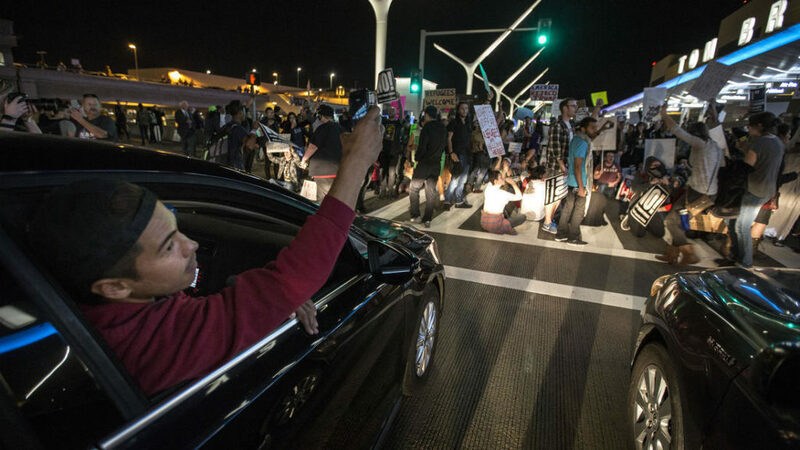 Demonstrators block the Los Angeles Airport in a bid to free those detained inside by customs officials, January 2017. Photo from the LA Times. This experience of interconnection, collective power, and shared consciousness is class formation in motion, through internal relations. If struggles were able to circulate this way through the entire circuit of capital, across large geographies and through key sectors of capital accumulation, then a true “general strike against Trump” would become possible. Such a rupture would comprise more than a mass mobilization of individuals, taking time off work to participate based on their commitment to ethical principles or bourgeois rights. Instead layers would mobilize as class subjects, acting within and against the capitalist relations in which we are trapped, and demonstrating in the process our collective ability to shut down––and transform––society as a whole. Given the incredible complexity of the capitalist system, it is hard to anticipate how struggles will circulate through the web of capitalist relations that exist today. In the case of the airport blockades, for example, it would have been difficult to predict that an upsurge against Trump’s immigration ban would be localized at airports, and would come to involve law students, taxi drivers and Uber users. Our best hope of contributing to these circulations and leaps, therefore, lies in cultivating broad and flexible networks of militants in many different working class sectors, with some connection to political fault lines that continue to erupt. This arrangement would allow militants to bridge interconnected sectors in moments of struggle. It would extend the social, economic and political impact of such clashes, and forge insurgent blocs through successive ruptures. Instead of seeking decisionmakers to pressure or organizations to make statements of solidarity, these militants could ask: which sectors of the proletariat are organically connected to this rupture? What activities might provide immediate material support to it, while extending the crisis for capital? What collective identities and imaginaries might stitch these sectors together? Such networks are already emerging in the proliferation of militant organizing projects across the U.S, from tenant solidarity networks to anti-ICE rapid response networks. A generation of militants forged in the crucible of recent struggles is cohering in these groups, and gradually transforming from activists demanding radical democracy to revolutionaries seeking systemic change. Committed revolutionaries should participate in these projects as equals, helping them to connect with one another, strategize and coordinate. All the while we should maintain an unyielding critique of social democratic politics, develop a vision beyond redistribution and civil society, and build the organization necessary to act on it in moments of rupture. 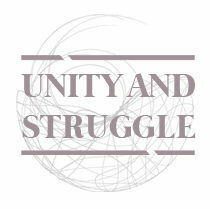 Unity and Struggle is one of many groups carrying out these important efforts. We invite you to join us. 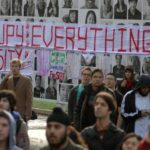 New Student Occupations in California: Which Way Forward?